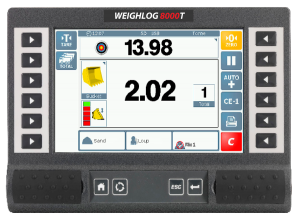 The Weighlog 8000T features a full touchscreen display with a collection of icons surrounding the screen and physical push buttons along the bottom and sides of the display. Most operation of the 8000T scale is done using this display. 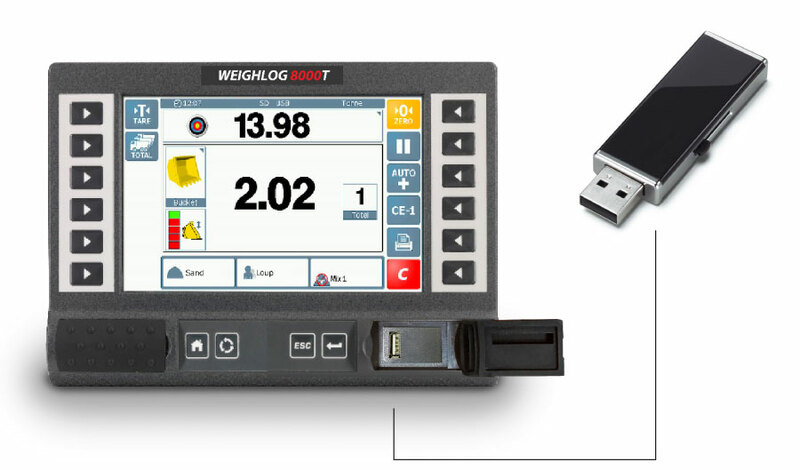 The Weighlog 8000T scale can store up to 50 Products and 100 Customers. Customizable through the corresponding icons on the touchscreen display. In addition, customer defined target loads are automatically associated with each product. Increased loading efficiency by never stopping the machine to weigh a bucket, ultimately improving your bottom line. Customer, product and load information can be stored through either SD card or USB memory, depending on your preference. Define target loads per truck or customer. Further increasing loading efficiency. Print receipts in cab of each load for your customers or your own records. Weighing your load correctly from the wheel loader saves time by reducing trips to the scale, increasing efficiency and profit. The touchscreen display is extremely responsive and easy to use. Easily configure your customer and product data, target loads, loader attachments and more. Large weight readings are easily visible and a small form factor provide for an unobtrusive view of your operation. Manage a collection of information on products, customers and loads. Built in SD and USB memory for storage and in cab printing capabilities can further help manage your operation.